Wouldn't life be sweet if there was some kind of miracle cream that would completely eradicate all the signs of aging? Well, it isn't that easy. If it were, each one of us would look young for the rest of our lives! The magic lies in perseverance. 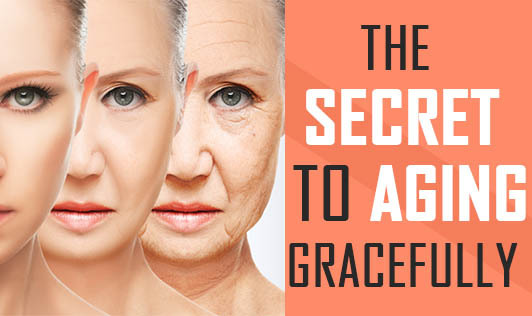 It is the key to graceful aging. A holistic approach is required in order to change or influence our physical body which means working on the physical, intellectual, mental and spiritual components of our being. All these components interact with each other, making us what we are. One needs to live a balanced life, with the right choice of good nutrition, sufficient sleep, a good amount of water and some fresh air to cleanse the body from dying cells and keep our systems young. "Sustained effort and unbending intent" is what is needed for one to age gracefully. You cannot feel and look good if you think negative most of the time; hence learning to recognize and cut out such negative feelings and thoughts is important. Practicing relaxation techniques and doing physical activity on a daily basis can help one change and take control of his or her own mind's habits, therefore sending positive thoughts to our body. This happens through the free flow of energy gained by practicing a balance in life; thus, slowing down the aging process of the physical body.